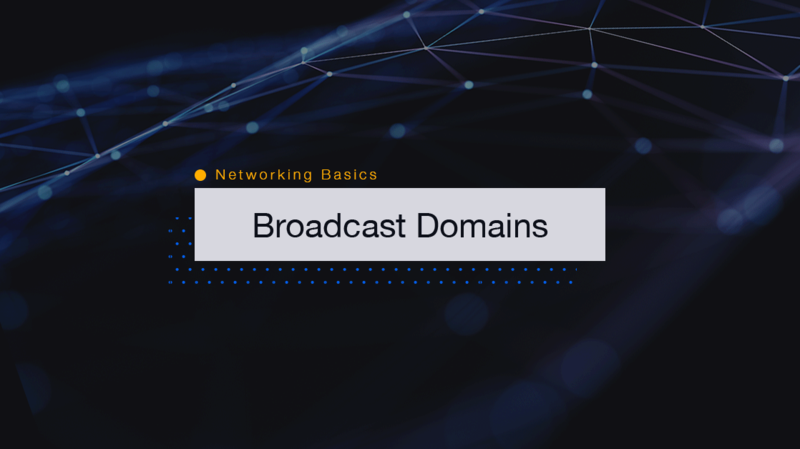 Blog home / Everything CBTN / Networking Basics: What are Broadcast Domains? The Quick Definition: A broadcast domain is a logical division of a computer network, in which all nodes can reach each other by broadcast at the data link layer. Let’s say you have several computers connected to a Layer 2 switch. The reason the device is called a Layer 2 switch is that the hardware learns and stores the MAC address (also known as the physical address) of a device’s network cards. By storing those hexadecimal numbers, the switch can make intelligent decisions about how to route packets to and from a specific device. Layer 2 switches can also be configured with VLANs to service multiple networks. Since the switch has learned about the devices that are connected, it also knows (from the switch configuration) what network those devices are connected to. From our definition of a broadcast domain, we can also state that a broadcast describes a process that forwards packets to all machines on the network. Only devices communicating within a given network will receive the broadcast traffic. Also, broadcasts do not cross network boundaries, i.e. broadcasts are not routable from one network to another. If they did, you can imagine the amount of traffic that would be generated across networks and/or the internet! We mentioned the MAC address earlier. This is a unique address assigned to all network interfaces. It is expressed as a hexadecimal value like ac:de:48:00:11:22. A Layer 2 switch stores these values and knows exactly what port on the switch a given MAC Address is connected. When a packet is sent to the device with MAC Address: ac:de:48:00:11:22, the switch immediately forwards the packet out of the connected port and straight to the device. No other devices on the network have to listen to or process that packet. This helps to reduce the amount of ‘noise’ and overall traffic on a given network. A broadcast packet has a specific hexadecimal value for the destination MAC address: ff.ff.ff.ff.ff.ff. When a switch receives this value, it knows to forward the traffic to all devices on the network where the broadcast originated. If you have 24 devices connected to a given network or VLAN on your Layer 2 switch, all 24 devices will receive and process all broadcast packets on that VLAN. A common example of a broadcast is when an IP address is dynamically assigned to a device using DHCP. When the device requests an IP address it sends a broadcast out across the network looking for a DHCP server. If there is a DHCP server present, the server will send the next available IP address directly to the device that sent the request.